Clearly only the highest quality thread must be used; thin but durable. Is the thread also a Ruby Red color? 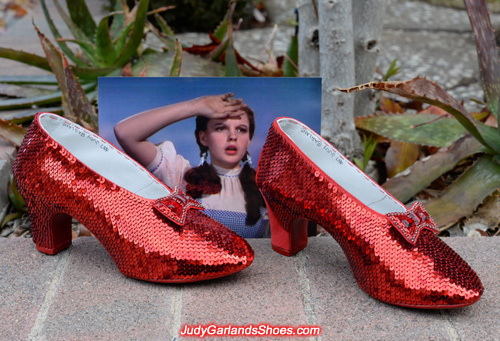 Yes, the thread is ruby red and also strong so that the sequins are tightly attached to the shoe. 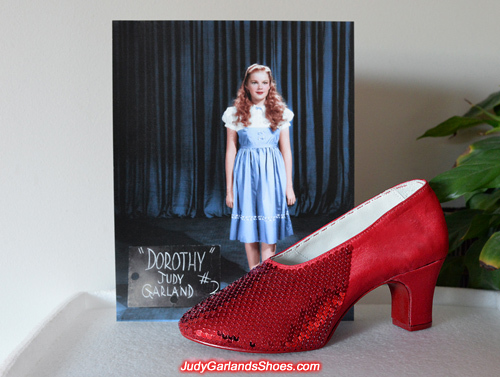 You don't want any loose sequins because when Judy Garland as Dorothy walks or jumps on the set, they won't fall off. Do you paint the wooden heels yourself? Reckon it must be an exact shade of paint. The wooden heels are not painted but covered with red silk fabric for sewing. The leather heel caps is nailed into the heels and painted. 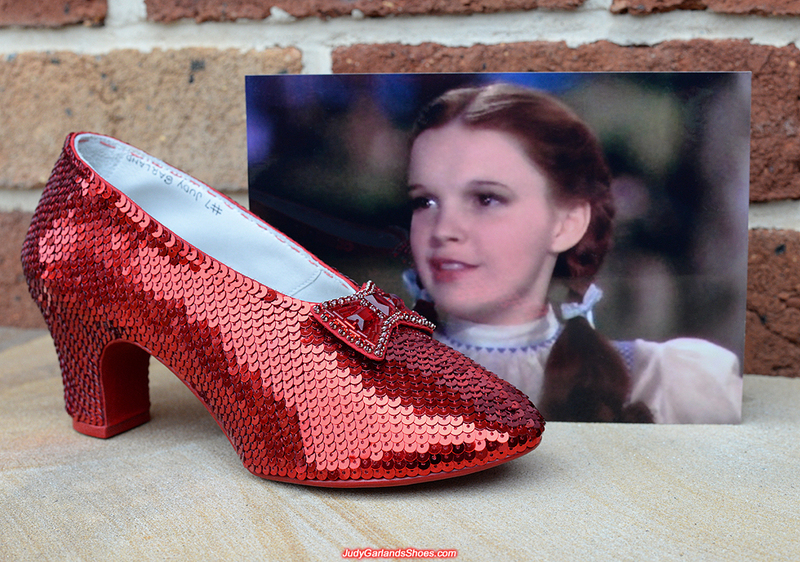 Our ruby slippers look very authentic because of our wooden heels which is only available through us. Apologize for pestering you. Are the sides of the heels covered permanently with red silk fabric? If so how do you attach? It is so very fascinating. You're not pestering me, I'm always happy to answer questions. Yes, the sides and back of the heels, as well as the shoe uppers are covered permanently with red silk fabric by sewing them onto the shoes. 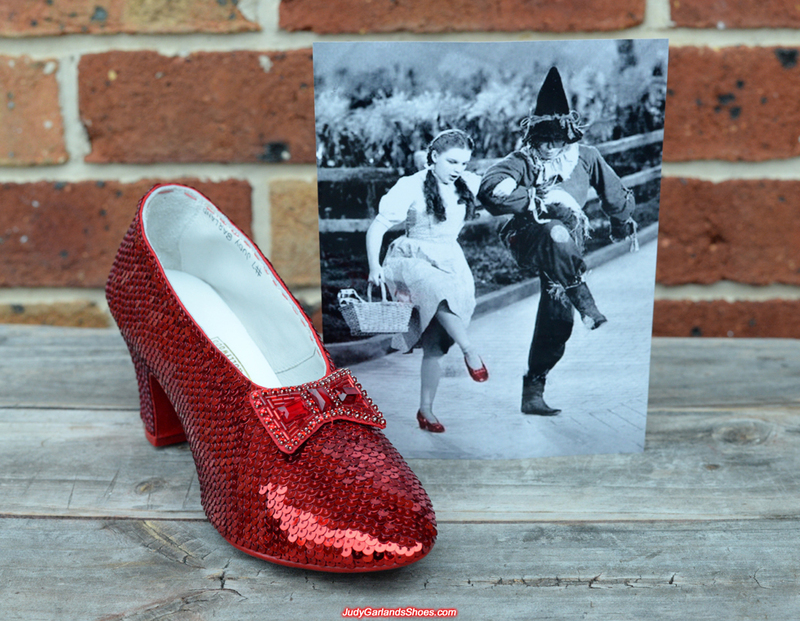 Once the sequins covers the shoes, you will not see the fabric, but sparkling red just like in The Wizard of Oz. The sequins beautifully overlap each other in a fish scale pattern. 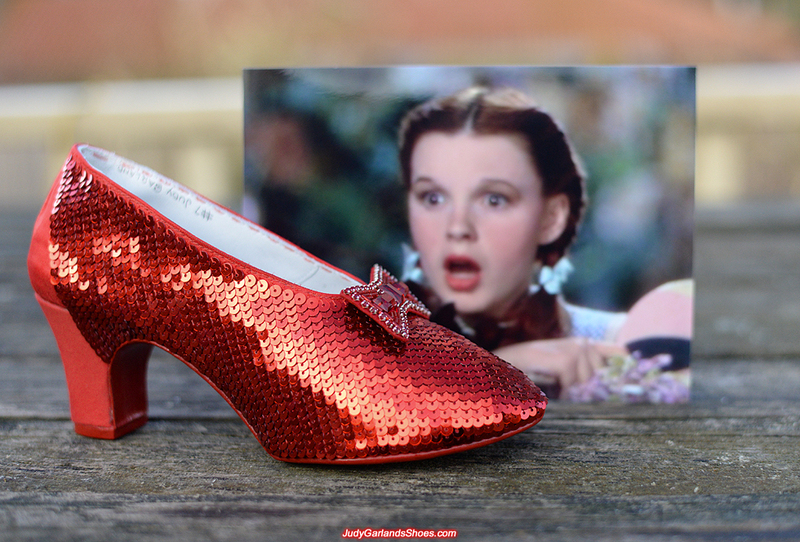 We are renowned for our ferocious attention to detail when crafting hand-sewn ruby slippers. am I right in thinking this provides support? We have finished sequining the right shoe and attached the bow. It looks absolutely beautiful, remember every sequin is sewn by hand. Do you ever suffer from cramping or stiffness in your fingers and hands after sewing for an extended period of time? What measures to you take to ensure your hands stay healthy...e.g. manicure, soaking in hot water, massage, etc.? My hands and fingers always feels fine because I like to take plenty of breaks during the day. In the Wizard of Oz, when we first see the Ruby Red Slippers on the feet of the recently deceased Wiked Witch of the East, is the patternofthe shoes the same as when Dorothy first discovers the shoes on her feet? 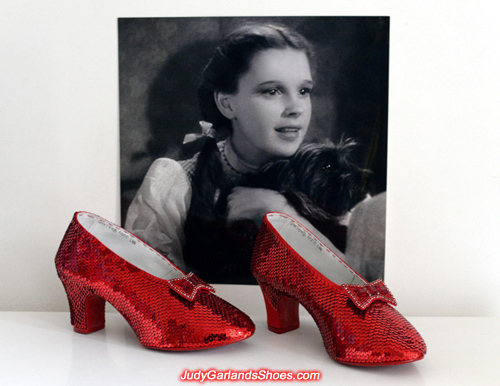 To answer your question, it is believed that the ruby slippers on the Wicked Witch of the East is the same pair worn by Judy Garland as Dorothy when Glinda zaps them on her feet. This is because we can clearly see in both scenes that the ruby slippers doesn't have orange felt on the bottom on the shoes. Other pairs had orange felt to muffle the sound of her footsteps. Sequining on the left shoe is just as beautiful as the right shoe. There's still a lot of work to do as the ruby slippers begin to take shape. 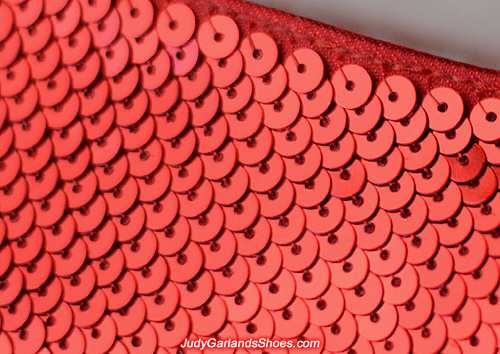 Sequining on the left shoe is really neat and firm as we continue sewing our way towards the back of the shoe. The shape of the size 5B shoe and heel looks perfect and it goes a long way to making a pair of ruby slippers beautiful. 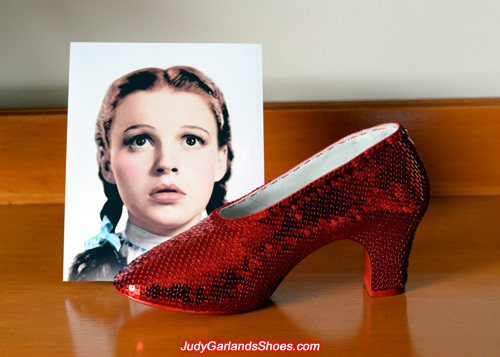 Remember the heel is made from wood as were the heels on the original ruby slippers. 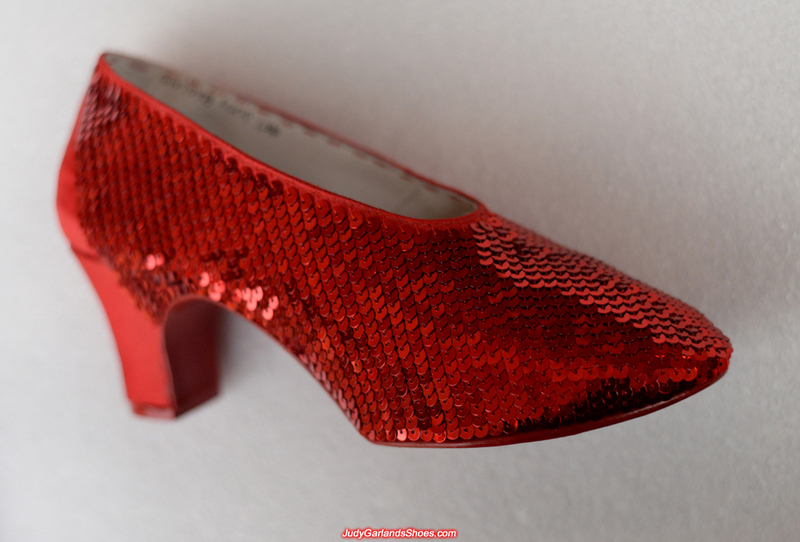 Initially, MGM didn't plan to have bows on the original ruby slippers but after tests they decided to include bows to make the ruby slippers look more beautiful with big "gems" in closeup shots.